A new mix series focusing a new direction in END's dark alternative dance sets! END returns to DARKOTICA in Cincinnati at Mixwell's Northside! END is a special guest DJ at HAVEN's special KINK event! END returns to Boston for CEREMONY'S DEAD MAN PARTY! DARK SIDE OF THE CON III March 29-31! Catch END at North America's only Dark Alternative Culture + Fan Convention! Signaling 2009 all New Years' week at these solid events. Hope to see some of you ready to throw down- check out the available links! Pictures for a special gallery on the website will be taken too! The last night at the legendary SAVAGE GARDEN venue! Celebrate in style with a big party unlike anything before with special guest END: the DJ (Komor Kommando, Xenomorph Productions)! Click the image to vote on The DJ List! Get a FREE copy of THE CHROME ELEMENTAL Album! Click on the image below for a FREE hi-quality MP3 download of END's first official mix album THE CHROME ELEMENTAL featuring new & unreleased tracks straight from the underground club scene! Seb Greeting "The Chrome Elemental"
Check out new photos to be online of END: the DJ in some of the gear- Necrolord mask, gauntlet, rivet head hoodie, Dementia Boxer shoes- for The Chrome Elemental tour provided by the amazing people at Cryoflesh Cyber-club clothing shop. (TULSA OK) The Return to ASSIMILATION Nov. 22! 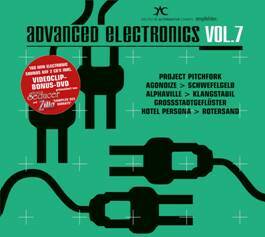 Komor Kommando On Advanced Electronics 7! Just in time to be put under your Christmas tree, Synthethic Symphony presents Part 7 of the most successful electro/EBM compilation series around! Also this time, this latest Volume comes as very fair priced, double-CD+DVD package in digipak! As with the previous volumes, also Vol. 7 not only contains the biggest names of the electro-scene, but also a number of promising Newcomers – and as always, also this volume includes a high number of EXCLUSIVE songs and remixes! Without a doubt one of the best done, and most popular compilation with more than 2 hours of sound and 18 Videoclips. On MySpace: Add the KOMOR KOMMANDO Page! Thanks to Those Who (re)Voted On The DJ List! The NEW single from the new album- FREE download! THE CHROME ELEMENTAL album- available in November! In CHI-TOWN on Halloween weekend for one of the major events of the season- A Date With The Dead! All evening long- over 8 hours of music & stage performances! The ball will also have DJ Seraphim, who I've heard of for a while now- be a pleasure to meet- and notables such as Ashlee Phoenyx with models as Industrial Girl and many others. Expect a fashion catwalk as well as a costume contest to go along with the fetish demonstrations galore. Click on the image to check out the Club Heaven venue! The Tour Goes Into XILE (The OC, CA) Wed 29 Oct! Back home to CA for the tour next week- it's been a very long time. Catching up with good friends, back on the coast...all during Halloween week! I suppose it was but a matter of time before I decided to startup something on this- after all, supposedly it's supposed to be the best catch-all way to collect and cross-promote all one's blog entries, and I seem to be in many web portals these days. I'm still collecting my thoughts amid this hectic schedule of photoshoots, album, touring and so forth, so bear with me and I should be getting started very soon. This is the blog I hope everyone will want to check in regards to me in relation to anything related to dark underground club music. Expect to catch news regarding Xenomorph Productions, touring, some upcoming work with all the artists that command my attention and lots more.